November continues to be the month for Masonic revolution, apparently. On November 21st, it was announced that St. John's Lodge in Dayton, Ohio had been formed as a new member of a group calling itself the Grand Lodge of All England (which should not be confused with the United Grand Lodge of England). 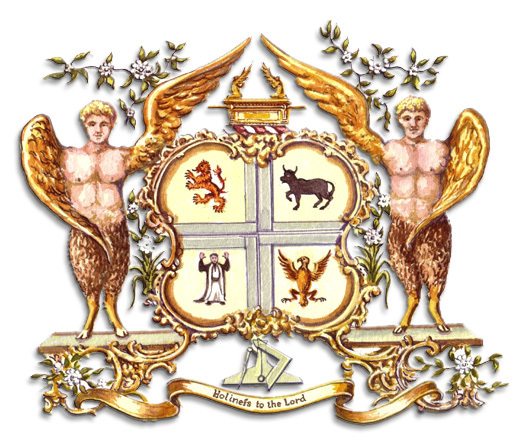 The Grand Lodge of All England, in spite of its claims of great antiquity, appeared in 2005. Their website is registered by someone named Daniel Scherr, who also shows up around the web as a member of Morning Star Lodge #38, of the Most Worshipful Benevolent Grand Lodge of Ohio, Inc. The MWBGLofO, Inc. is unrecognized and considered to be a "bogus" GL by MW Prince Hall Afiliated GLs. (Not my term, it comes from the Phylaxis Society's Commission on Bogus Practices). As a side note, several years ago, someone named Dan Scherr listed himself as a member of something called Eureka Grand Lodge, which is a Prince Hall Origin (formerly National Compact) GL, also considered bogus by PHA GLs (as all PHO GLs are). If you think mainstream recognition gets complex, you haven't lived until you start digging into Prince Hall history from the 1800s. My apologies if, due to the vagaries of the Internet, I have erroneously associated two different Daniel Scherrs with this story. The Telegraph is reporting that author Richard Leigh, co-author of Holy Blood, Holy Grail, The Temple and the Lodge and many other projects with Michael Baigent, has passed away at 64, apparently of a heart attack. 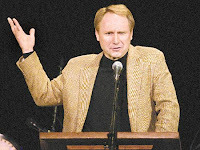 Baigent and Leigh unsuccessfully sued Dan Brown in 2006 over a claim that he plagiarized their material from Holy Blood, Holy Grail in his book, The Da Vinci Code. Props to brothers Akram Elias and Mark Tabbert in an article today from Agence France-Presse. Flash to news organizations — we Freemasons don't know when Dan Brown's next book is coming out either. Go ask him. 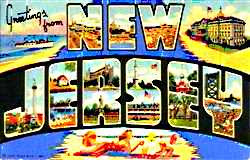 Alice, Wiley and I will hit the road Friday for Burlington, New Jersey where I'll be speaking at the Feast of St. John Dinner on Saturday. On Sunday, we turn north and drive to Salem, Massachusetts so Alice can finish some final research on her novel. No, it's not about witchcraft. Thanks for asking. And I want to stop at Lexington, Massachusetts and see the Scottish Rite NMJ Museum, since we'll be right there. After that, we'll head back home by cutting across upstate New York. We've never been through that part of the country, and something in me wants to pass through Batavia, just to say I've done it. Anyhow, were planning our route. So is there anything great sight we shouldn't miss? We have a little flexibility in our return schedule, so drop me a line and let me hear from you. Interesting commentary on the generation that is now knocking on the doors of our lodges. How does this compare with what we are seeing in our lodges? Unlike the generations that have gone before them, Gen Y has been pampered, nurtured and programmed with a slew of activities since they were toddlers, meaning they are both high-performance and high-maintenance, Tulgan says. They also believe in their own worth. Change, change, change. Generation Yers don't expect to stay in a job, or even a career, for too long…They don't like to stay too long on any one assignment. This is a generation of multitaskers, and they can juggle e-mail on their BlackBerrys while talking on cellphones while trolling online. Gen Yers have grown up getting constant feedback and recognition from teachers, parents and coaches and can resent it or feel lost if communication from bosses isn't more regular. Some conflict is inevitable. More than 60% of employers say they are experiencing tension between employees from different generations, according to a survey by Lee Hecht Harrison. The survey found more than 70% of older employees are dismissive of younger workers' abilities. And nearly half of employers say that younger employees are dismissive of the abilities of their older co-workers. Assuming that the information in the video below is true (and some of it is undoubtedly a stretch), I leave it to you to ponder these statistics. I think the most interesting question posed by the whole piece was that if there are more than 2.7 billion searches performed on Google every month, who answered these questions before Google? Gentlemen, progress has never been a bargain. You have to pay for it. Sometimes I think there's a man who sits behind a counter and says, "Alright, you can have a telephone, but you lose privacy and the charm of distance. Madam, you may vote, but at a price. You lose the right to retreat behind the powder-puff or your petticoat. 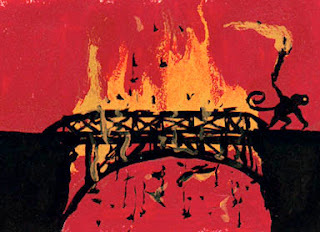 Mister, you may conquer the air, but the birds will lose their wonder and the clouds will smell of gasoline." What does this have to do with our fraternity? 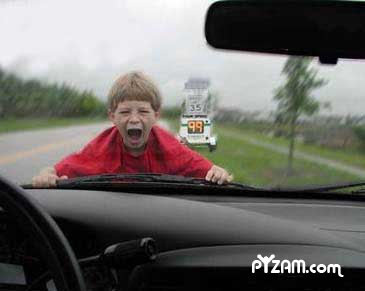 Obviously, the exponential growth in information and speed affects virtually everything in society. Likewise, it affects Freemasonry. An ever-increasing number of men are knocking on our lodge doors after learning about us from the Internet. Individual Masons have been quick to adopt the web for masonic education and communications, but few Grand Lodges have embraced it. In fact, many Grand Lodges regard the Internet with suspicion, or treat it as insignificant. And more than one Grand Master has seen the Internet as a threat to his unquestioned authority — suspensions and expulsions over e-mail and forum postings rises every year, most recently in West Virginia. So what should Freemasonry be doing to embrace the technology, beyond posting instructional videos on YouTube? A group of enthusiastic Scottish Rite Masons from Plano, Texas have crafted a new edition of Albert Pike's Morals & Dogma in a unique manner. It is a side-by-side comparison, presenting Pike's original words on one page, with an updated, more modern, less inscrutable version on the other. According to the advance announcement, "Morals and Dogma for the 21st Century is a modern interpretation of Albert Pike’s Greatest Work. We have taken the entire original book and translated it into modern English, streamlined the ideas, organized the flow of thoughts, updated many of the historical examples, and clarified many of the points that are easily misread." As a Fraternity, we need to teach our Brethren what it means to be a Mason beyond paying dues and attending business meetings. We need to focus on the quality of our Masons and not the quantity. We need to reinforce our differences from other civic or charitable organizations and lift the fog that has obscured our path of progress and prosperity in recent years. This book is far too important to the Scottish Rite to be lost forever. This "translation" of the work seeks to inspire a return to the basics and renew our belief in the importance of giving our new members a starting point for their Masonic journey and a foundation upon which to build. 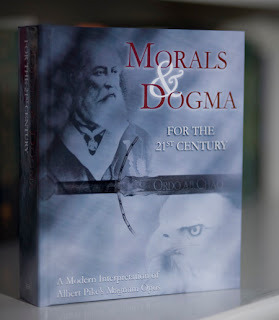 Volumes have been written about every aspect of the original edition of Morals and Dogma, but none of these efforts has made the beauty and lessons of the book any more accessible to the vast majority of our membership. Analysis and commentary is only useful when the source material is well understood. The neglect of the last several decades has rendered this work withered and fruitless, but it is as relevant today as it was in 1871. Its lessons need to be repeated again, and again, and again. It is with an absolute reverence for Albert Pike and for the Ancient and Accepted Scottish Rite that the compilers of this work have endeavored to make Morals and Dogma more approachable and accessible to the modern reader. In no way do we intend to displace (or replace) his work from its exalted position, so rightly and fully deserved. Rather, through this effort, we hope to inspire our audience to read Morals and Dogma in its entirety and in the original language. Only in this way, can the Brethren of the Rite fully appreciate Albert Pike's sublime language and explore the book's deeper mysteries and speculations. 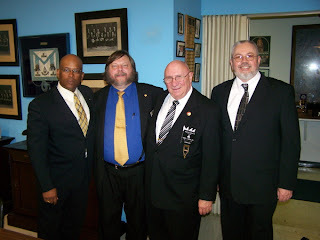 The authors — James L. "JJ" Miller IV, Brian A. Chaput, William R. Goodell, and Kevin K. Main — are all "black hat" 32° Masons from Plano Lodge #768, and proudly proclaim that none of them are "past anythings." The first printing is limited to 5,000 copies, and the first 1,000 are signed by the authors. Price is $49.00, and it is available online from Stone Guild Publishing. Hat tip to Brother Ron Martin on the Philalethes Yahoo group. 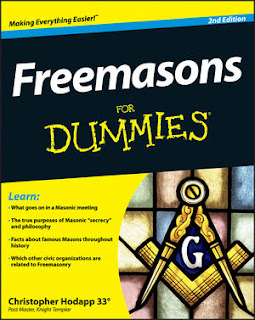 I know you through the" freemasonry for dummies", both in English and French. When you visited Paris I had the opportunities to talk to you and I felt that you were an open minded person. So I am surprise to read not for the first but for several time now your disdain or contempt about the GOdF. First of all I am not a member of the GOdF but a lot of my brethren are. The GOdF is one of the oldest masonic institution in the masonic world with a rich history linked to many historical important events or personage. But what surprise me the most it's that you seem not to know the GO history or the French history where the GOdF have its roots, but anyway you have a very bad opinion about it. An opinion that I am used to read under the pen of anti masons. You mention a protest, ( in a reply on your blog), it was the celebration of the separation of state and church in 2005, you must understand that this law passed 100 years was the symbol of freedom not only for French Freemasons but also for Jews, Protestant and Freethinkers. But I don't see why it is ashaming to celebrate freedom ? Do I judge decades of American freemasonry just looking at a Shriners parade ? I can believe that an intelligent person as you look may think that your masonry is the real thing, but I am sure that you know that each country, each culture, maybe each historical period, have is own masonry. I don't know exactly where is the origin of your problem with the GOdF, but I think it's maybe because you don't have all the information to make yourself a... fair and balanced opinion. If you need a "GOdF for dummies" I can ask the competent brothers all the information that you need. Surely my comments about the GOdF haven't approached anti-masonic levels. Perhaps my abominable fluency in French leaves me with a misunderstanding about what I have read, along with what friends in the Grande Loge de France. and Grand Lodge National Français have said on the subject of the Grand Orient de France. But I don't think so. I happen to disagree with the concept of making atheists into Freemasons, as does my own Grand Lodge, all mainstream and Prince Hall US Grand Lodges, the United Grand Lodge of England, the Grand Lodge National Français and the Grande Loge de France. The overwhelming majority of the Masonic world regards the basic concept of Anderson's phrase, "that religion in which all men agree" as requiring a personal belief in a Great Architect, regardless of some of the intellectual acrobatics some have tried to use to argue against it. When Anderson warned against being a "stupid atheist," I don't believe he was intending to give "smart atheists" a pass. 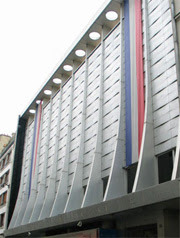 The Grand Orient de France has a long history of taking official positions on laws and social topics, including protesting against private schools – principally because Catholics ran the majority of them. I do understand the social forces that resulted in the antagonism between the Catholic Church and continental Freemasonry, and the Grand Orient de France has been at the center of that controversy since before the Revolution. Society has been very different in France than nearly anywhere else in the world, so Masonry developed differently there. It took an alternate developmental path than its Anglo-Saxon brethren, and became so different that it caused the schism in 1894 that resulted in the formation of the Grande Loge de France. The Grand Orient de France and the other "CLIPSAS" grand orients and grand lodges have a more easygoing attitude about regularity and recognition questions. They call themselves "liberal," and that is very true. Some readily admit atheists, under the explanation that they espouse intellectual and spiritual freedom. They charter or allow visitation with "adoptive" (female) or mixte lodges. That's their prerogative to do so. But it is the policy of the rest of the mainstream Masonic universe to regard them as irregular, and not to recognize them. Modern Freemasonry is largely wrapped around Anderson's writings, and on principal landmarks that we share in common — two of them are a monotheistic belief and no initiation of women. The most ancient landmarks of Freemasonry, from before Pike or Mackey or Anderson, descend from the Old Charges from the 1390s, and those Charges required a belief in God, and that the candidate be free, male and of a mature age. When those are thrown aside, the organization that is left sounds like Freemasonry, but is in fact something quite different — regardless of how satisfying it may be to its members. Personally, I greet all Masons as brethren, male or female, believer or atheist, regular, irregular and everyone in between, because all of us took an obligation that is essentially the same. As Masons, we all have similar values and are united in the concept of making the world a better place, one person at a time. I don't ask to see a dues card first. And to leak a family secret, my wife would join a female masonic lodge in a heartbeat if there was one close to us — I'd even encourage her to do it. But I won't violate my obligation when it comes to sitting in an unrecognized lodge (unless my Grand Master grants me dispensation), because that's what I gave my word not to do. And I disagree strongly with some of the practices of the Grand Orient of France. Their concept of "laicite" is an admirable concept that individuals should strive to achieve, but not an institution that was founded on faith in a supreme being. Reading the GOdF's material makes it very clear that the official antagonism specifically with the Catholic Church is still an important part of their official position. I realize anti-Catholicism in France is often a big crowd pleaser, and the Grand Orient is the largest, most popular Masonic body in France. I just don't want my Grand Lodge in some kind of officially sanctioned battle with any church — and especially not the church I grew up in. Belief in complete tolerance of faiths is one thing, but declaring philosophical war on individual faiths is something else. If you want to fight the Catholics about their past influence in France, more power to you. Go join some anti-Catholic reform brigade and protest your hearts out. It's just not the role of Freemasonry. Now, that's not judging them based on one parade. That's assessing them based on their own published information. However, I do hear ya' about those Shrine parades. Disney has released two new long clips from National Treasure: Book of Secrets. Broad Ripple Lodge No. 643 will again be participating in the Indianapolis Prince Hall Thanksgiving dinner program this year. Like last year, the program hopes to serve hundreds of meals to the homeless, shut-ins and others who would otherwise not have a Thanksgiving dinner – an annual tradition that began back in 1983. Broad Ripple #643 is honored to again be a part of it. To my Indianapolis brethren, if you can spare just a short time away from your family on Thanksgiving morning between about 9 AM and noon, stop in at the lodge at 22nd and Central Avenue, and just pick up one box of dinners to deliver. You'll find appreciative brethren there, and a cheerful chaos of cooks, servers, drivers and interested bystanders. And you'll find a grateful stranger on the other side of a door, truly thankful for your brief effort. It will give you much to thank the GAOTU for when you sit down at your own table that afternoon. Many thanks to Wbro. Wilson Lorick and the brethren of Fidelity Lodge No. 55 for their invitation to us again this year. Effective Monday, November 19th, Charles L. Montgomery, Grand Master of Masons in West Virginia, has expelled Most Worshipful Brother Frank Haas, Past Grand Master 2005-6, from Freemasonry, by edict, at a meeting of Wellsburg Lodge No. 2. Wellsburg Lodge’s charter was placed on probation for failing to hold a trial of MWBro. Haas for his "activities" of the last 14 months. Wbro. Richard Bosely, Deputy Grand Lecturer, was also expelled. Two weeks ago in a stated meeting, Wbro. Bosley brought up questions about votes taken in Grand Lodge's session in October, and was subsequently stripped of his grand officer status in the parking lot by Grand Master Montgomery after the meeting. 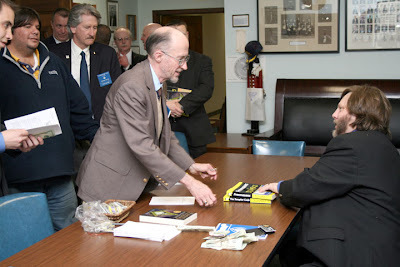 I met PGM Haas in Pennsylvania at the first speech I gave after Freemasons For Dummies was released, and I have admired him ever since. He has always seemed to me boundlessly cheerful, with a bright vision for the future of Freemasonry. He has especially been dedicated to assisting Demolay, which the Grand Lodge of West Virginia does not support. 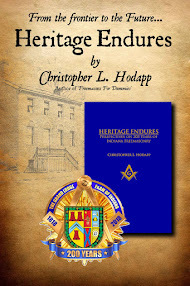 He had as his goal during his tenure as Grand Master the hope of bringing West Virginia's Masons forward in time. Apparently, there are those who disagreed with that vision, and have taken issue with him now that he is not Grand Master. It now appears that Cleveland's Halcyon Lodge No. 2 has company in their revolution. Euclid Lodge No. 3 has been announced in Grand Rapids, Michigan by Brandt Smith, its new Worshipful Master. No. 2 and No. 3 of what, neither lodge has publicly stated yet. Nor has Euclid made it known what about the Grand Lodge of Michigan was keeping them from their goals of creating a lodge of high standards, education and visionary leadership. perhaps that will be forthcoming. Smith was once a member of Doric Lodge #342, which seemed from its website to have an active and excited young membership that was accomplishing good things. Executive Vice President Mike Andrews has asked that we forward this information to you, in order to make you aware of what is apparently a nationwide scam involving checks drawn on the Boston Shriners Hospital account, which was discovered Tuesday, Nov. 6. The checks carry the hospital's address, logo and other identifying information; have been sent to individuals throughout North America, along with a letter from INCAS FINANCIAL INC., 2900 Kingsway Avenue, Edmonton, AB Canada. The letter states that the recipient has won a $50,000 prize and that "an assistance check of $3,187.60" (or some similar amount) is enclosed to help pay for the "tax and administration expenses (International Clearance fees)" involved with the individual's winnings. The recipient of the letter and check is instructed to call a phone number, and the individual who answers instructs the recipient to deposit the check and then call back for further instructions. The legal department at Shriners International Headquarters is reporting this scam to the appropriate U.S. government agencies and officials. If you receive any calls or inquiries regarding this situation, please forward them to Attorney Bradley Buethe at 813-281-8152. In the event that Bradley is unavailable or out of the office, please direct the calls to John McCabe (813) 281-7113. I'll be speaking to the High Twelve Club in Columbus tomorrow (Thursday, Nov. 15th) at noon, at the Columbus, Indiana Sirloin Stockade. If you're in the area, please stop in, have lunch, and say hello. On Monday, November 12th, at 8:10 PM, Halcyon Lodge No. 498 voted unanimously to surrender its charter to the Grand Lodge of Ohio and cease to recognize the authority of that Grand Lodge. Several of the brothers reassembled later that same evening for the purpose of forming amongst themselves a new Masonic lodge unaffiliated with the Grand Lodge of Ohio. More news of the new lodge will follow. Almost as quickly as it was announced on its website, the site seems to be down today, but according to a post on thebluelodge.org, it is now Halcyon Lodge No. 2 — although no purported Grand Lodge affiliation is claimed yet. Former Georgia Mason Jeff Peace has been associated with Halcyon over the last year – both philosophically and physically, as a speaker, webmaster and honorary member. Speculation is that Halcyon No. 2 is probably now part of the United Grand Lodge of America, if there is such a thing outside of the Internet and a few participants' wishful dreams. This event is scarcely a surprise, given their activities over the last year or so. "Halcyon Charities" was set up in December 2006, and if I recall a flurry of postings by one of its more outspoken members, ownership of their impressive Temple was transferred to their charity – a somewhat transparent preemptive move to keep the building from reverting to the Grand Lodge of Ohio's ownership if they lost or gave up their charter. I do hope there is some mechanism by which Halcyon members who did not agree with giving up their charter can be allowed to transfer membership to another lodge. On the other hand, these men have not been shy or coy about what they were clearly planning to do, and shame on any Halcyon member who was too uninterested to make themselves aware of the impending change and plan accordingly. The website for Halcyon Charities (again, shut down as of this writing) said that their goal was to "make this facility the cornerstone of a multi-faceted charitable enterprise focused on youth development. . . We already house youth athletic programs and will be initiating other youth-oriented cultural programs, including theatre, art, and music education. We will also support other charitable entities by opening our facility for their activities." I wish them the best in this noble purpose, even if I disagree with their methods. An unknown Mason has posted a blogsite dedicated to the loss of several Masonic lodges in the Cleveland area. This is clearly the fate the Halcyon men are struggling to avoid. The odds are against them, given their most recent actions, but it's not my fight. Maybe they'll show us all. Maybe they'll be the first to show us a different path to the future of Masonry. I doubt it. I hope they find what they are seeking by opting out of the GL of Ohio. As with all new ventures, there will be no one else to take the bows and credit from their successes, and no one to blame but themselves if they fail. Having said all of that, I expect the full weight and wrath of the Grand Lodge of Ohio to now come down on them, with much legal precedent. I have suspected from the day I heard it that their transfer of assets to "Halcyon Charities" was illegal. And if the GL does NOT accept their charter back, it leaves open the very real possibility that the GL will appoint new officers and simply evict the young turks who started all of this mess. And it is likely that, given the sort of revolution they have tried to start, they have probably doomed the building they sought to save, by their own actions. The next few days will be . . . interesting. Okay, sure, it's a little early for buying airline tickets. But the Grand Lodge of Scotland has announced that the 2nd International Conference on the History of Freemasonry will be the last weekend of May on the 29th, 30th and 31st in 2009. "2009 is a significant year for Scotland and Freemasonry as it marks the 250th birthday of Scotland's National Bard - Brother Robert Burns. It is hoped that a part of the conference will be devoted to Robert Burns and especially his Masonic activities." Start working on those papers now! And keep watching the Grand Lodge of Scotland's website for breaking news. It's not being reported as such, but the monument at the Tippecanoe, Indiana battlefield (as in "Tippecanoe and Tyler too" fame) has been defaced with anti-Masonic grafitti. Graffiti was spray painted on the Monument at the Tippecanoe Battlefield late Wednesday night or early Thursday morning. Phrases such as "Tecumsehs Not Dead," "Justice Will Be Served" and "Give Back Our Spiritual Capitol" were spray painted on the Monument. Wednesday was the anniversary of the Battle of Tippecanoe, which took place in 1811. Battlefield Park Manager Kathy Moore is not sure if the date had anything to do with the vandalism. 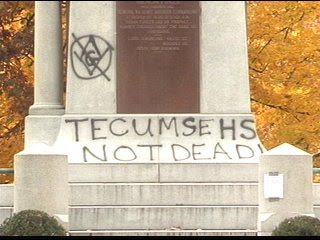 "It possibly could since they stated Tecumsehs Not Dead, but really I have not idea. It could just be a coincidence," Moore said. Moore said she does not know what the graffiti means, but she is upset that it happened. In addition to what was reported, both a square and compasses and an all-seeing eye were both painted on with the universal circle-slash "no" symbol over them. Hopefully, the graffiti will be gone for Sunday's annual commemoration ceremony. The Battle of Tippecanoe was fought on November 7th, 1811 between the US Army commanded by General William Henry Harrison and a band of Shawnees led by the brother of Tecumseh. 75 were killed during the battle. I'll have the truly outstanding honor of speaking at the Feast of St. John dinner on December 1st at the Masonic Fellowship Center in Burlington, New Jersey. I'm especially looking forward to meeting many New Jersey and New York brethren I have only known via the Internet – especially brothers Steve Schilling and Cory Sigler who helped set this trip up. It should be a great evening! Masonic Home Fellowship Center, Burlington, NJ. Deadline for tickets is Wednesday, November 21, 2007. Tickets may be purchased by mailing a check along with a self-addressed, stamped envelope along with the names of those attending to the Grand Secretary's Office. Tickets must be paid in advance. No tickets will be sold at the door. Table reservations may be made for groups of 8 or 10. This Saturday I will have the honor of speaking at Vincennes Lodge No. 1's Past Masters and "Old Timer's Dinner" at the Vincennes University Trailblazer Room in Governor's Hall (Mixer at 6PM, dinner at 6:30). It may be too late for reservations, but contact Secretary Burnell Davis. Earlier in the afternoon, I'll be signing books at the Knox County Public Library's McGrady-Brockman House, 614 N. 7th Street, Vincennes, from 2-4pm. If you are in the vicinity, please come out and say hello. Many thanks to Wbro. Chris Kimmel for his kind invitation and his tireless work setting this event up. I’d like to take the opportunity to publicly acknowledge the political campaign of my lodge brother Timothy Maguire and his wife Allison. Both Tim and Allison ran for two of the Indianapolis City Council ‘at large’ seats on the Libertarian ticket in this year’s November election. No, they didn’t win. Even in politically turbulent elections like this one, Libertarians don’t generally do well. I’m not hawking for the Libertarians here, nor am I trying to make political hay against those whose favorite horse lost yesterday. But a close look at the final results tell a lot about the message that Tim was able to articulate to the public with no money and a campaign that didn’t begin until summer. He and Allison each drew more than 12,000 votes apiece out of the 164,000 ballots cast in a 12-way race. They each drew 25% more votes than the other two Libertarians in the same City Council race, and three times what the Libertarian running for Mayor received. That’s impressive, and they should be proud. More important, Tim and Allison stood up out of a sense of duty, with a desire to make a difference in a city where the overwhelming majority of its citizens fail to act day in and day out. Anybody can do that. They did more. And they deserve our thanks and gratitude. They certainly have mine. Many, many thanks to the brethren of Ann Arbor and Detroit for their incredible welcome last week. The Table Lodge at Golden Rule Lodge #159 was attended by almost 50 brethren, and the dinner was spectacular (filet mignon or Cornish game hens! Wow!). Bravo to the brothers who performed magic in the kitchen! Thanks especially to Worshipful Master Gary L. Thomas and his officers and members who set up such an outstanding evening. And to the many visitors who came out, as well. 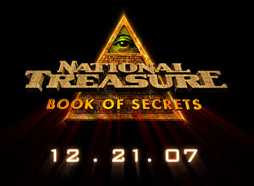 National Treasure II: Book of Secrets is due out on December 21st. Despite all of the Masonic symbols used in the teaser trailer above, who knows if there will be any Masonic connections or references in it. I hope so. In finishing the manuscript for Conspiracy Theories and Secret Societies For Dummies, we talk about the true story of what is the central Maguffin to NTII: Book of Secrets – the very real diary found on John Wilkes Booth's body, and the pages that went missing after it was found. Union spy Lafayette Baker was hand-picked by Secretary of War Edwin Stanton to be the head of the National Detective Police in 1862, and quickly played fast and loose with the almost unlimited powers of arrest he was given during the war. He lost the plum job after he went just a little too far – tapping Stanton's private telegraph lines. Baker was brought back by Stanton to find and arrest John Wilkes Booth after Lincoln was shot. Twelve days later, Baker and his men traced Booth to Garrett's Farm, where Booth was shot. Baker found his diary and delivered it to Stanton personally, who promptly locked it away. During Congressional hearings that attempted to link Lincoln's vice president Andrew Johnson to the assassination, Baker came forward and revealed the existence of the diary, which an embarrassed Stanton was forced to produced. When he handed the booklet to investigators, 18 pages were missing from it. Now, the diary was actually a date book, and it's possible Booth had used pages from the center as scrap paper, and torn them out himself. Or Baker may have torn them out, figuring to accuse his old boss out of revenge for firing him. Or maybe Stanton removed the pages, because he was actually implicated in the plot. Baker then said he had ciphered pages that proved Johnson was a Southern agent, and accused Johnson of ordering the pages torn out (or did it himself). Stanton was no friend of Johnson, so it's unclear who would have benefitted most from the removal of whatever may have been in the diary. In any case, Baker never produced his coded papers, and was dismissed by Congress as a somewhat spectacular liar. Baker died 18 months later of arsenic poisoning, coinciding with several private visits from his brother-in-law – who just happened to work for Stanton. Coded messages were found in the 1960's written in a military manual once owned by Baker, and when deciphered, revealed that he had feared for his life, and that he believed Stanton would have him killed. Modern analysis of his hair samples revealed the arsenic – officially, he was said to have died of meningitis. And the missing pages of the diary? They've never been found.